Warren Stokes knew nothing about bitcoin until his son began receiving yellow postal bags filled with $50 notes in the mail. The cash was from cryptocurrency trading when his son was still in high school — about seven years ago. "He explained to me he was on a group on reddit — 1,000 people were joining their computers together to mine, and again, honestly, I had no idea what he was talking about." Mr Stokes, 58, is now a casual "crypto" investor himself. At a recent cryptocurrency meet-up in Sydney, he was there to learn about the latest craze: initial coin offerings (ICOs). An ICO uses blockchain technology to issue digital "tokens". Investors buy them using established cryptocurrencies like bitcoin or ethereum to fund companies or to access specific services, such as data storage. An ICO use blockchain technology to issue "coins" or "tokens" for a set time period. Investors buy them using established cryptocurrency to fund new projects. An ICO may also issue "utility tokens", which are used to access specific online services. The "tokens" can then be traded peer-to-peer. Most investors buy into an ICO on the promise of its whitepaper (a document that describes the project) alone, meaning tokens are sometimes sold without revenue, customers or a functional product. Importantly, the value of these tokens is rarely pegged to anything in the real world, so prices can fluctuate dramatically. So far, the life of the ICO has been short and often brutish. A recent Ernst & Young study, for example, estimated more than 10 per cent of the US $3.7 billion raised in ICOs by late 2017 had been stolen by hackers. Levels of seriousness may also vary. Consider the Jesus Coin ICO, which promises, "global access to Jesus that's safer and faster than ever before". Some ICOs have had more success, however, such as Australia's Power Ledger, which aims to trade energy on the blockchain. Nevertheless, the legal battle is just beginning over ICOs that allegedly overpromised or set out to deceive. The cryptocurrency project Tezos completed a $US232 million ICO in 2017, but it is now facing a US class action lawsuit from people who claim they were defrauded. There is also the "decentralised bank" AriseBank, which had its assets frozen by American regulators in January for allegedly being "an outright scam". In 2017, the Chinese Government banned raising money via ICOs, and regulators globally have warned they cannot be used to circumvent financial regulation. Locally, if an ICO appears to be funding a company, then the tokens it issues may be considered shares by the Australian Securities and Investments Commission and attract reporting obligations. At the meet-up, however, the audience mostly celebrated the ICO's underdog status. Since 2012, Alex Saunders has offered cryptocurrency advice on his YouTube channel. At the event, where most questions were prefaced with, "I'm new to this", hopeful investors clung to him with the gratitude of drowning sailors. For Mr Saunders, an ICO is a way for start-up founders to avoid being manipulated by traditional venture capital investors. "Our systems have the chance to level the playing field." For ICO investors, there is the appeal of operating outside the traditional financial system, but also the lure of getting rich quick. And of course, the ever-present "fear of missing out". The fresh faces at the meet-up suggested that for many, buying "crypto" was likely to be their first time speculating on anything. Newcomers who went into debt to buy in before the most recent cryptocurrency crash were spoken of in hushed, regretful tones by the attendees of the meeting. "I've heard people are taking out money on their home loans to get into cryptocurrency," Mr Saunders said. "Unfortunately, there are lots of people in this space and this is their first investing experience so they've been burnt once or twice and they're learning that the hard way." For an old hand like Mr Stokes, the psychology of all trading is something these young people are learning, albeit bitterly. "Some people who don't know how to ride out a drop have sold out at the bottom," he said. "There will be a lot of people who will panic and lose their money." Two ICO investors, who asked to be called Katrina, 27, and Neil, 40, said they have had varying success. "I invested in TRON … which worked out really well," she explained. "It's a Chinese-based entertainment platform." Neil said he had participated in about nine ICOs so far, but suggested it could be hard work to sort the scams from the genuine products. 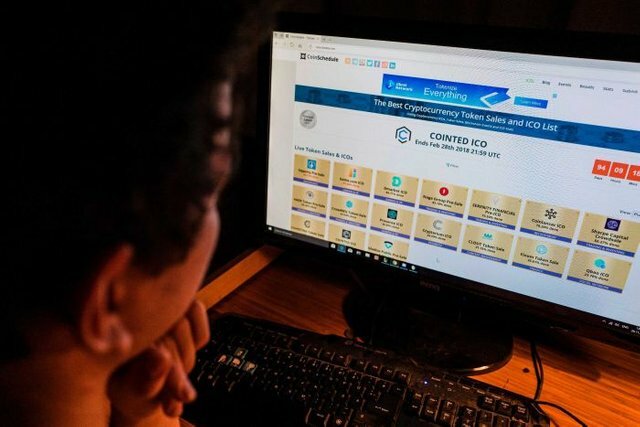 He pointed to the case of Confido, a cryptocurrency start-up that claimed it was developing "smart contracts". After its November ICO, which raised a reported $US375,000, the Confido team disappeared in what's being called an "exit scam". "With the number of scammers out there who have made really high-quality fake websites and fake LinkedIn profiles … it's actually very difficult to know what's true and what's not," he warned. In Neil's view, the hype is settling down and ICOs will now have to prove themselves as a genuine financial tool. In 2018, its evangelists hope the ICO will become more than a white paper, fancy graphic design and blind faith. Or it will not. But you can be sure someone, somewhere will invest either way. You got a 20.00% upvote from @bearwards courtesy of @avi007! This post has received a 7.55% UpGoat from @shares. Send at least 0.1 SBD to @shares with a post link in the memo field.